Funko's line of Evolve Pop! figures is just downright adorable. 2K Games and Turtle Rock Studios’ Evolve is being released in just a few short weeks. If you consider yourself a big fan of the game based on what you’ve read, seen, and experienced, then you might want to show your love for Evolve by purchasing merchandise based on the game. Funko is one of my favorite toy creators, and today, they’ve announced they’re adding Evolve to their famous Pop! figures line. As you can see, the Pop! 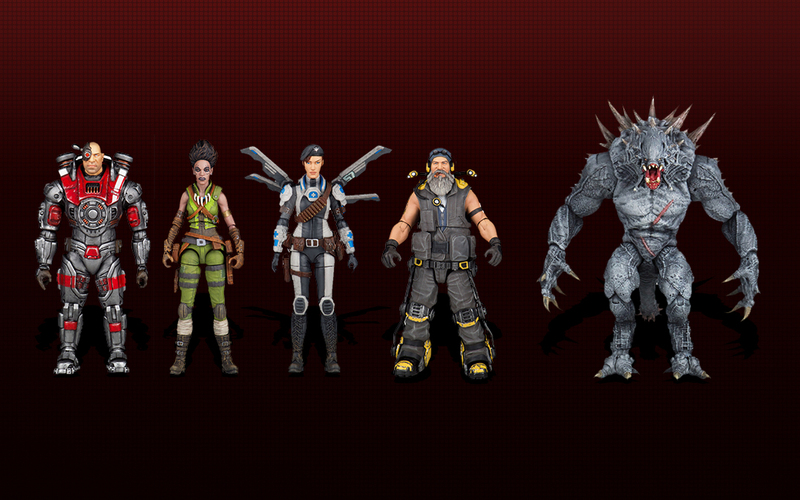 figures line includes Markov, Val, Hank, Maggie and Goliath, the last of which stands at 6 inches. But that’s not all as those who prefer their figures to have a more realistic look can check out the Legacy line, which features all of the previously listed Hunters and Monster from Evolve, but their design is a little less cartoonish. The Evolve Pop! figure line will retail for $9.99 each and be made available in March, while the Legacy figures will run you $19.99 each and become available in April. If I had to choose only one from either set, I’d have to go with the Goliath Pop! figure. I mean, c’mon - look at that face!